All of Anita Martinez’s quotations have been translated from Spanish by the writer. On the day after making it to Memphis, Ana “Anita” Martinez was admitted to the hospital. She spent six weeks there, having a dialysis treatment almost daily. “My blood was poisoned,” she recalled. She had come from El Salvador to Dallas, Texas, three years before, in 1995, leaving behind gang violence that cost her two brothers and two sons. As many Latinos do, Anita lived an exhausting lifestyle in Dallas, working night shifts at an air conditioner factory and cooking as many as 50 pupusas in the daytime to sell at the factory. “No wonder your kidneys gave up, sleeping only two hours a day,” the doctor had told her. When her medical treatment was done, she moved to Memphis on recommendation of a relative; she soon found herself unemployed in a new city, without a house and with a huge medical debt. The frantic Dallas years had allowed her to have some savings, and she rented a small apartment close to the hospital, where she had to go for dialysis treatment three times a week. “I couldn’t really get a job, given my condition, but I still needed to find a way to make money,” she said. And so she started cooking pupusas at home, basically for her Central American neighbors, who would show their support as they enjoyed those nostalgic flavors. It was then that “Anita’s,” her business brand, got started. “I cooked them just like at home with queso, chicharron and even loroco [an edible flower very popular in Central America],” she said. Pupusas are considered El Salvador’s typical dish, although they’re also widely consumed in Guatemala and Honduras. They are stuffed, thick flatbreads made of cornmeal. Nobody really taught Anita how to make them; they have always been part of her life. 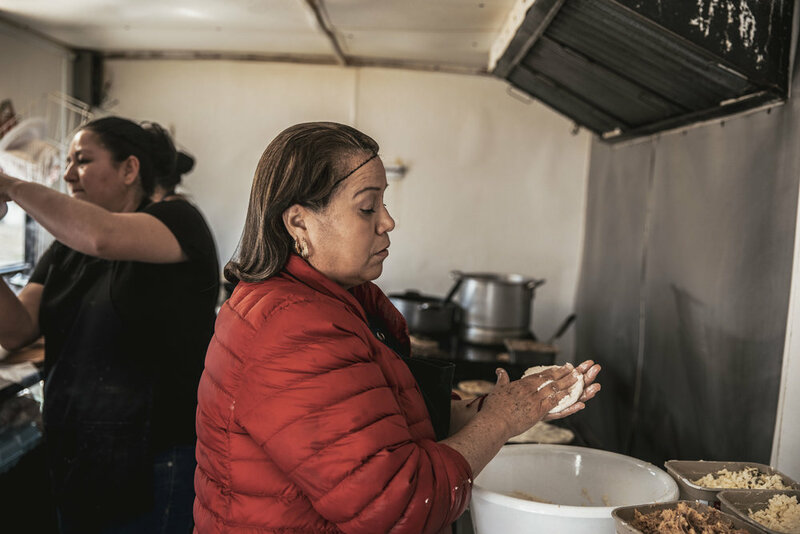 “One of my oldest memories is that of me and my siblings shelling the corn, and then our mother using la piedra de moler [grinding stone],” she said. This is a typical Mayan way to process tender corn. It took her less than a year to save enough money to get a little wooden trailer built. Every weekend she would drive it to the flea market on Highway 61. In addition to pupusas, she would sell bed linens and secondhand clothing items. Her business became very popular. “Back then there weren’t many Latinos in Memphis, so basically all of them used to know who I was: Anita, la de las pupusas [‘the one of the pupusas’],” she recalled. In 2002, her older sister donated her a kidney. Finally capable of working every day, Anita ditched the linen venture and focused completely on growing her food business. “My dream had always been to open my own restaurant, so on top of the pupusas I started to do other Salvadorean dishes, like tamales [Salvadorean tamales are cooked in a plantain leaf, unlike Mexican ones, which are cooked on a corn leaf] and menudo [a soup made of rumen],” she said. She would work seven days a week and lived in a trailer. “I really didn’t live there, only slept there,” she laughs, full of energy. She bought a larger trailer and turned it into a food truck that worked every day on Jackson Avenue, as her original small wooden trailer visited fairs and parties. “We would set a tent up to cover our tables in the summer and had gas heaters in the winter. We would never stop,” she recalled. Now she focuses her food business on her restaurant, Pupuseria Anita’s, which she opened in 2018 on the corner of Summer and Stratford. It has already become a kind of unofficial family club for Salvadoreans and Guatemalans. “People like it here because we do things like back home. No canned beans, no processed foods—we like everything fresh even if it’s a bit more work, so they keep coming now that it is much more comfortable with the indoor setup,” she said. She also offers fresh fruit cocktails, snow cones and homemade marmalades. Nowadays, as she’s in her mid 50s, she keeps her restaurant closed on Mondays. “I have worked very hard to get here,” she said. She now offers Mexican food too in order to reach a broader audience, but she admits that pupusas are people’s favorites. “We got people coming from other cities to try them: Little Rock, Jackson, you name it. We have a couple from Tupelo—an American woman married to a Guatemalan—who come every Tuesday when he’s off,” she stated proudly. She’s no longer doing the cooking herself, but her aides follow her instructions and she keeps on top of every detail. She’s recently been told she needs a new kidney transplant, and she’s preparing for it. This time the donor will be her 28-year-old daughter. Anita has no plans to retire anytime soon. “I have been blessed in this country thanks to all my hard work,” she said.